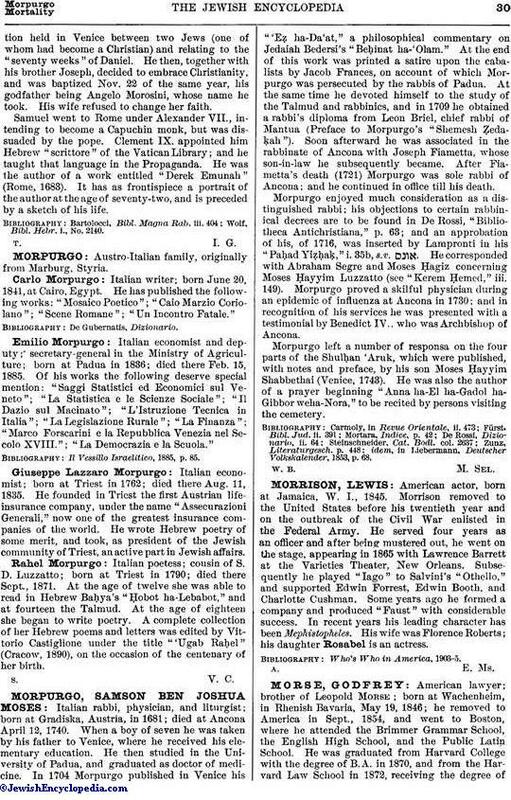 American lawyer; brother of Leopold Morse; born at Wachenheim, in Rhenish Bavaria, May 19, 1846; he removed to America in Sept., 1854, and went to Boston, where he attended the Brimmer Grammar School, the English High School, and the Public Latin School. He was graduated from Harvard College with the degree of B.A. in 1870, and from the Harvard Law School in 1872, receiving the degree ofLL.B. In 1890 Tufts College conferred on him the honorary degree of M.A. Morse taught English literature for a short time in the Evening High School, Boston; he was admitted to practise law before the Supreme Judicial Court of Massachusetts, July 22, 1873, the United States Circuit Court Oct. 2, 1874, and the Supreme Court of the United States Feb. 3, 1879. From 1876 to 1878 Morse was a member of the School Committee of the city of Boston; from 1882 to 1883 he served as member of the common council; and he was elected president of that council on June 18, 1883. During the years 1882, 1883, and 1884 he was assistant counsel of the United States in the Court of Commissioners of Alabama Claims. In 1887 he was elected a member of the board of trustees of the Boston Dental College; and in Sept., 1896, was chosen delegate to the National Democratic Convention, which met at Indianapolis. 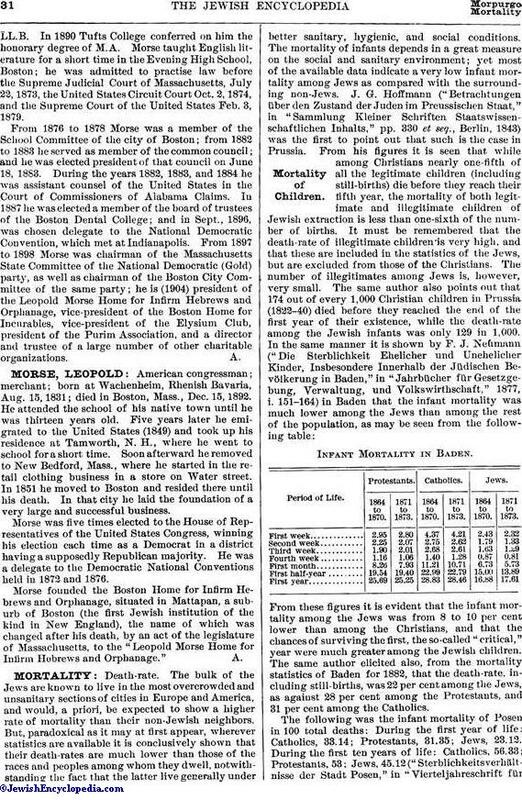 From 1897 to 1898 Morse was chairman of the Massachusetts State Committee of the National Democratic (Gold) party, as well as chairman of the Boston City Committee of the same party; he is (1904) president of the Leopold Morse Home for Infirm Hebrews and Orphanage, vice-president of the Boston Home for Incurables, vice-president of the Elysium Club, president of the Purim Association, and a director and trustee of a large number of other charitable organization.